The plum tree and apple tree are finally blooming! It’s beautiful, too bad I don’t have a digital camera. Today I worked in the garden: weeded the garlic, planted some cabbage starts, and planted carrot, beet, rutabaga, and parsnips seeds. I harvested a bunch of kale, chard, mizuna, and collards and brought them to school to share. One of the coolest plants growing is a variegated collard–it’s got white stripes and the leaf’s back is pure white. Wow. It got me to thinking about how far this squat lot has come. It provides so much food for humans, animals, and habitat for wildlife. Here’s a photo of it when we first started, 4 years ago. There’s a tradition of telling a hive when someone in the family dies, so I guess I’m telling you: a hive has died. I got too busy with work and the garden, I didn’t take the time out to open the hive regularly and check on the girls. 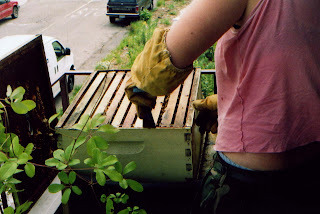 My desk used to face the hive, which is on the deck of our apartment near downtown Oakland. I used to monitor their comings and goings, then go back to typing, monitor, type, monitor…These days I’ve been bogged down with school and didn’t watch them as well as I should. Finally I went out and inspected the hive–there was just a little ball of bees and no honey or brood. My guess is the queen died, and hence, the hive was doomed. That little cluster would eventually die. Lucky for me it’s swarm season, and I hope to catch another. I think I’m going to relocate the hive, too, to a warmer, less windy spot. Another piece of good news: we have two other hives–one at a farm in Pescadero, another in the backyard of some friends in Berkeley. The photo is the hive in better days, an akebia quintata growing nearby. Chinese New Year: Boon for Farmer? Sunday after Chinese New Year in Oakland’s Chinatown. Billy and I trolled around for weird Chinese ice cream. He got a banana smoothie, I was tempted to try the red bean tapioca pearl but chickened out and got the hot cocoa with pearls. 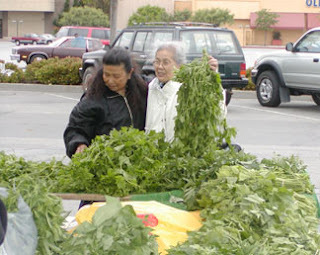 As we wandered around the desolate streets, as urban farmers, something caught our attention: boxes and boxes of greens. Bok choy, mustard greens, and only slightly messed up Asian Pears. We exercised restraint and only took two big boxes. This morning I dumped a whole box in the chicken area and they got very excited. The bunnies got more bok choy than they could eat in one, er, sitting. It may be the year of the pig, but these animals made out! Let the navel gazing begin! Inspired by my wonderful sister Riana, I’m finally entering the blog world. I first started farming in the city of Seattle in 1998. At the time, I was a book editor at Sasquatch Books, and one of our favorite authors was Carla Emery. She wrote a book called the Encyclopedia of Country Living. One day I was flipping through the newsprint pages of the book (this is how editors procrastinate) and happened upon a section called How to Build a Chicken House. By that time, I was gardening a little bit. I grew peas and some lettuces, but I hadn’t thought of actually growing animals. Carla inspired me, and soon we had three golden-laced wyanndotte chickens and a little hen house. In a strange coincidence, we later found an old Chinese billboard that read, “Hen”. We immediately hung in on our porch. I loved the eggs and the chickens. Eventually I moved to California. 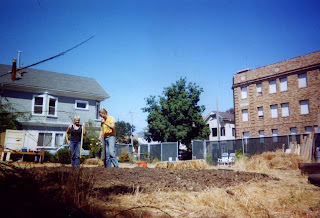 Now I live and farm in Oakland, CA. I can see downtown O-Town from my back porch, BART seems to run straight across my living room, as does I-980. It’s really spiraled from those early years in Seattle: to bees, ducks, turkeys, rabbits, geese, and I hope, one day, goats or a pig. A mini-cow, maybe?